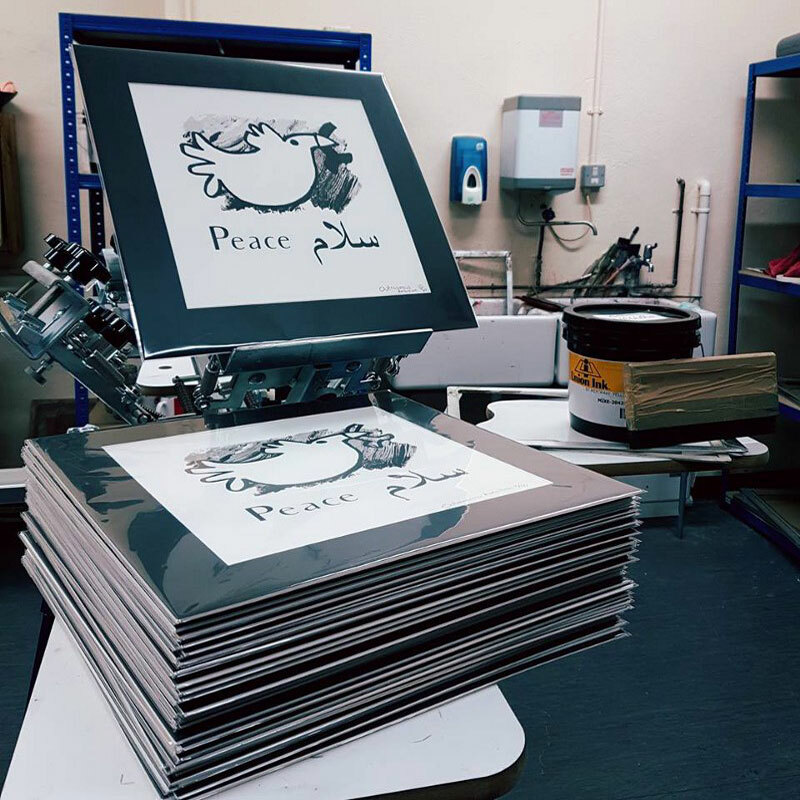 The Dove was conceived, designed and printed in the period before Christmas 2016 when the news broadcast daily the devastation brought by war to the people and the city of Aleppo in Syria. In contrast to their typically colourful, irreverent, playful work, Outrageous Ambition’s interpretation of the dove of peace is monochrome and sober. The foregrounded dove, smooth and bright-white, soars against a dark, turbulent background. There is a powerful symbolism in the stark contrast between the perfectly white dove with the olive branch in its beak and the ashen world it finds itself in. This contrast seems to create a jarring effect similar to that of the picture of a child among the grey rubble of a war-struck city. 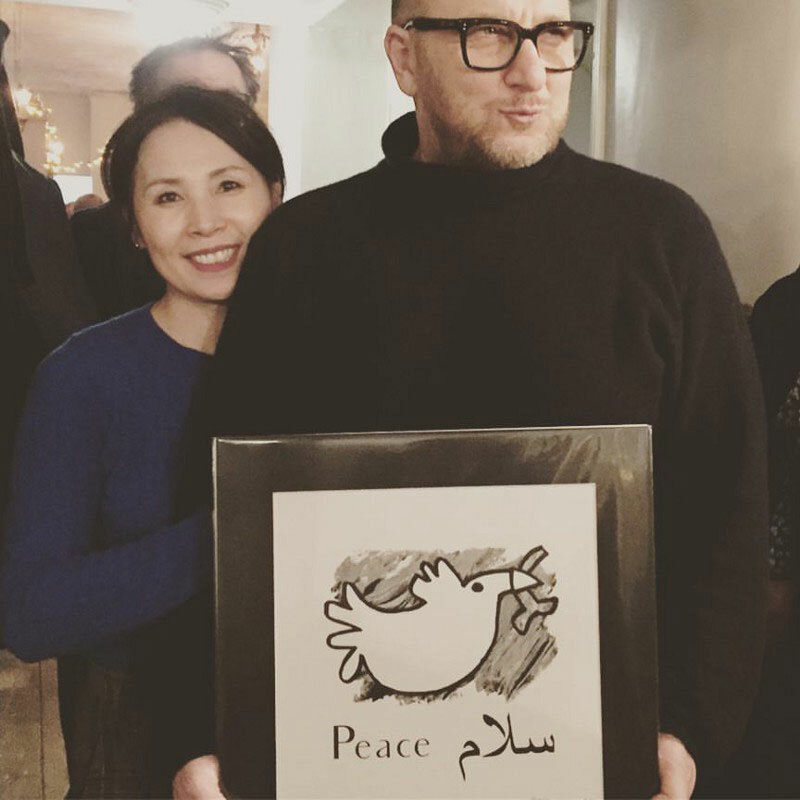 Underneath the dove, the word ‘peace’ is written in English and Arabic suggesting that peace is a common aspiration, the foundation of a shared humanity that thrives in peace and wilts in war. In the words of the Nobel laureate for literature, Georgios Seferis, ‘humanity is brittle like dry grass, and war cuts through it like a scythe’. The fifty prints of the Dove were donated to Refugee Action York (RAY).They were priced at £20 each and were soon all sold. RAY is a small — it employs four highly qualified, part-time members of staff – grassroots charity in York. In the words of one of its founders, Esme Madill, RAY aims to be a safe haven to those who have fled the unimaginable horrors of war and persecution, offering them a small corner of the globe where they can live with their families feeling welcome and safe in the same way that we would hope to find such a place if we were to have to flee for our lives. 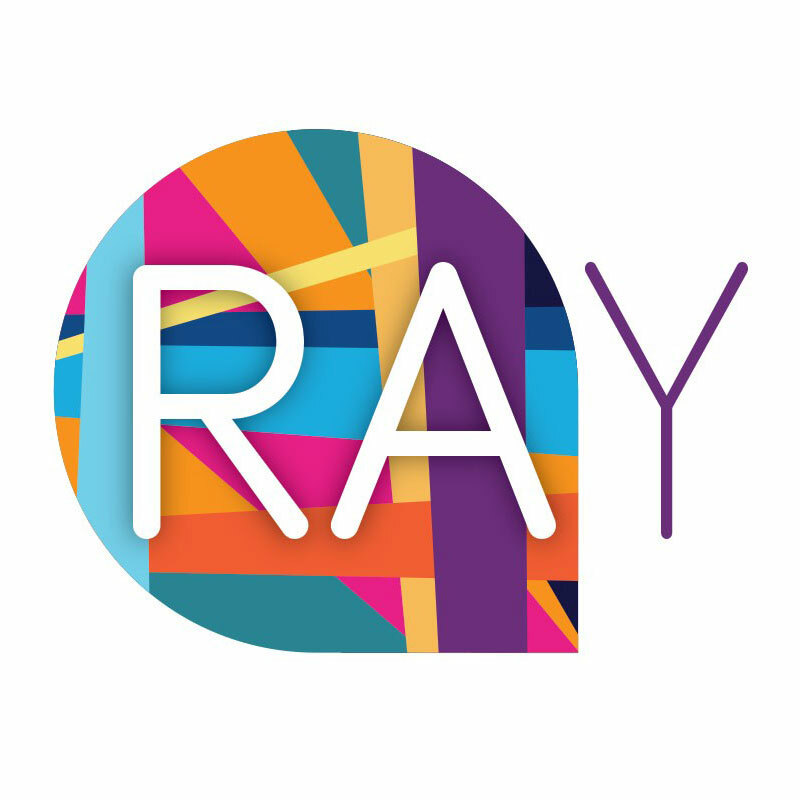 RAY’s website and leaflets will inform you that RAY runs a whole range of services for children and adults: English classes, homework support, a youth club, a weekly drop-in session, an information service, a weekly shared meal, a hardship fund, and community outreach, campaigning and educational activities. The website and leaflets however will not tell of the birthday parties for recently arrived children; the frantic search for lawyers and interpreters when families arrive from regions of war; the quick response to newly arrived people lacking warm winter clothes or to children lacking basic supplies for attending school. The promotional materials cannot describe the welcoming of people as entitled equals, the attention to nursing and to developing those very fragile and hugely important things: the children’s sense of self-belief and self-worth, and their entitlement to happiness and to an environment that recognises and appreciates their potential to blossom and thrive. In its years of existence, RAY has seen children using their services grow into highly qualified, highly in-demand professionals. Outrageous Ambition and RAY share the mindset of seeing potential and opportunities where others only see problems. 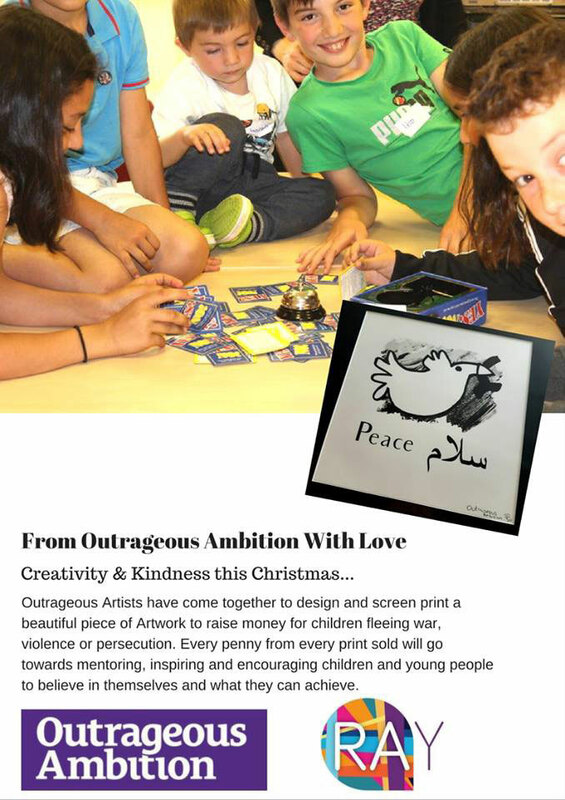 Which is perhaps why Outrageous Ambition did not seek to raise funds for any particular service or activity but rather for enabling RAY to inspire children and young people to “believe in themselves and what they can achieve”. How did the ‘Dove of Peace’ work for RAY? Fifty prints at £20 each should have made £1000 for RAY. In fact, they generated almost double that. Plus multiples of that in non-monetised, but no less real and important, social value. Many buyers offered more than the asking price. The stories of RAY and Outrageous Ambition imbued the Dove with additional layers of meaning, inspiration and desirability. The affordable pricing ensured that these stories, carried by the Dove along with its olive branch, reached people of all levels of spending power. The appeal of the picture generated its own dynamic. The owner of the Partisan & the French House restaurant and café at York, which is also an interior design gallery and shop, found the print fitting with the aesthetics and values of her business and accordingly asked for four prints which were put on display and soon sold. As the prints exchanged hands in the store, the stories of RAY and of Outrageous Ambition were also passed on. Strangers approached RAY asking to learn more about volunteering opportunities. 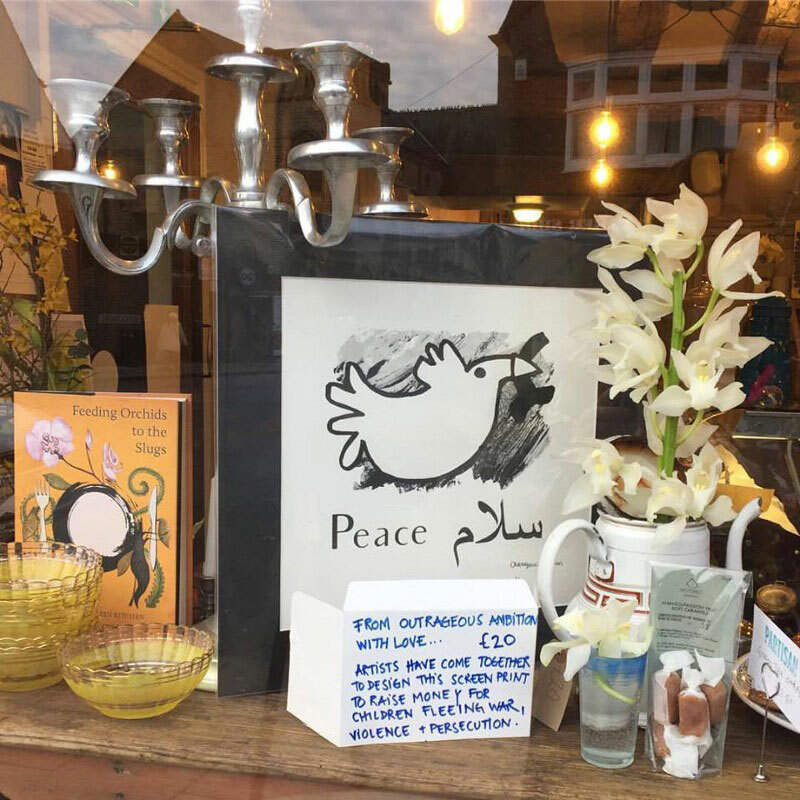 The same business owner organised a fundraiser in her shop with the proceeds split between RAY and Doctors without Borders. She is, at the time of writing, setting up a scheme of work placements in her business for adults supported by RAY after it became clear to her that many of them regard idleness as a wounding indignity. The prints of the Dove, like pebbles in a pond, energised expanding ripples of conversation and action. What work did the raised funds do? The money raised became part of RAY’s hardship fund. This is the pot of money the organisation draws on when an e-mail lands that reads: “… A family have just moved to York having fled a war zone — we need warm clothes and winter shoes and is there anyone who speaks French who can show them how to use a bus and reassure them they are safe…”. It also covered the travel expenses of a group of children to the Whitby Folk Festival where musicians who support RAY were performing. Lastly, it covered the travel expenses of a London-based, highly qualified and experienced trainer who donated her commercially very expensive services and delivered skills development workshops to the RAY team. The Dove did not just generate additional resources and ‘inputs’ for RAY: money, goodwill, publicity, new contacts, new volunteers, new relationships. Small, grassroots organisations in the UK function as a hidden, unseen infrastructure of caring and cohesion. Slowly, quietly, patiently, and largely unseen and uncelebrated, with small gestures and everyday actions and words, their work stitches back together an increasingly threadbare social fabric constantly coming undone. And like the physical infrastructure that we rely on for our electricity, water, and food, this social infrastructure, although vital, is often forgotten in everyday life, taken for granted and only missed when no longer there. To play this healing, holding, caring role is never easy and it can at times feel lonely and futile, particularly against the backdrop of gathering, towering waves of social anxieties that vocalise against organised kindness, against welcoming the stranger, that belittle, denigrate and marginalise those needing the services of this quiet, unglamorous infrastructure and the people providing it. To add to this, Christmas can be a hard time when losses and deprivations are most keenly felt. And, it is easy to feel that your efforts are small and inconsequential when set against the tragedies of war. The Outrageous Ambition prints created a buzz around RAY but also within RAY. On the part of Outrageous Ambition, the prints were tangible expressions of their appreciation of the beauty and necessity of the work of RAY. The people who responded to the appeal of the prints by buying them and making contact with RAY further validated this appreciation. The prints became platforms for the voice of RAY to be carried further than it would otherwise have and people were inspired to respond with warmth and kindness. But the prints were also platforms of appreciation and caring for the work of RAY and its people. We often need others to re-acquaint us with the enchanting aspects of our routine, everyday reality.